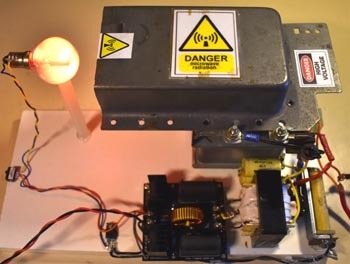 This experiment was initially built as an entry for the "Flashing Light Prize 2018". There are a couple of points worth explaining in more detail. Firstly on safety, microwave oven magnetrons generally operate around 850W and there are a number of risks with this energy. It is possible to reduce the output but there is a limit where the emissions stop abruptly rather than reduce. One of the threshold is the plate voltage must remain around 4kV. 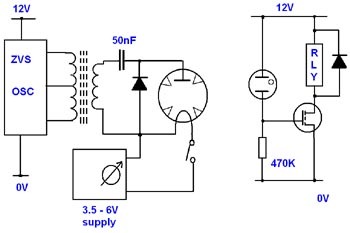 Using the doubler circuit and smaller capacitor reduces the energy available which does appear to work. 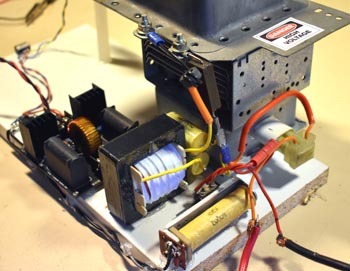 The magnetron is supplied from a 12V supply via a ZVS oscillator and homemade transformer. From a safety point it is worth avoiding big MOTs for this experiment. The 12V supply is loaded by 2A when microwaves are being radiated. The circuit still draws almost 1A when not resonating so the maximum output energy is going to be less than the 24W suggested. There is a link to the video at the top of the page. The design specification was to produce a flashing neon light with a frequency of 1Hz and 50% duty cycle. I have again used the "bad" practice from my 2017 competition entry. Switching the heater/cathode off and on modulates the emissivity of the cathode. (Not good for valves) This make use of the thermal inertia of the cathode to create a delay. For the feedback, a few ideas were looked at. (1) Use the ionisation as resistance in the lamp. (2) Generate a small voltage at an aerial and use this signal. 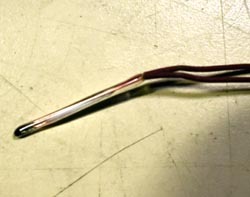 (3)Use a small bead thermistor to detect heating from the microwaves. The bead thermistor barely detected any change and the voltage obtained with the aerial was not as great as hoped. In the end the ionised gas proved to be an excellent feedback mechanism. Even though the gas is ionised by a strong signal it is possible to pass a small DC current through the ionised gas making use of the fact it is a conductor. In the case of the neon lamp being used here a resistance of 100k can be measured when glowing. The 12v feed from the DC power supply is use, via the neon plasma, to operate a relay on the heater driven by the MOSFET. Adjusting the distance from the wave guide and the voltage applied to the heater can give enough variables to set the flashing rate and duty cycle. 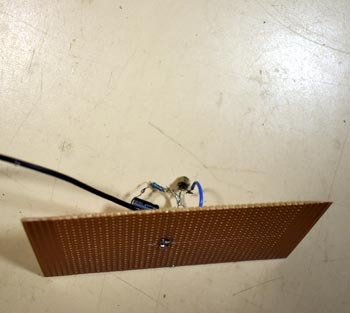 For the demonstration a switch was added to the 12V feed to the lamp to demonstrate the feedback is not created by pick-up in the gas plasma or lamp electrodes. 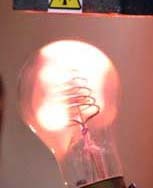 A number of neon lamps were tested but the limiting factor was some neon could remain ionised due to pick-up noise from the high plate voltage. As the high voltage is derived from a ZVS oscillator it has an AC content which radiates from the wave guide. Earthing the wave guide and anode would have solved this, however the circuit is fully floating and earthing any part stresses the bench power supplies. This may not be a problem for a few 100V but any more may damage a power supply. Finally it is quite fitting that a neon lamp was used as an energy absorber. A similar device (ATR) is used to prevent transmitted high energy pulses being reflected into receivers in radar aerials. 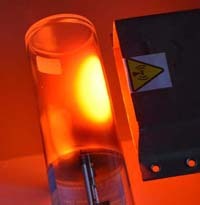 This is a "Hollow cathode" lamp used in spectroscopy. The large and electrode-less area nicely demonstrates the neon discharge in the RF beam. This lamp was the second choice for the flasher but wasn't as reliable due to noise on the plate PSU. The other image is of a "bee-hive" neon, this could produce a good flashing rate but duty cycle was tricky. This experiment requires voltage generation in excess of 4kV. Although the current is small the circuit is capable of delivering a severe shock and skin burns. The RF radiation will interfere with electronics in the vicinity and could be potentially damaging. Many safety considerations have been taken to produce this experiment. Not all have been covered here.